The world-famous Red Arrows display team will return to Blackpool this summer to perform on both days of the annual Air Show. It is the first time that the Red Arrows will feature on consecutive days of a Blackpool Air Show and this has been made possible through the switching of the free event to a Saturday and Sunday, rather than a Sunday and Monday as in previous years. 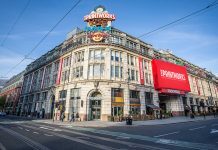 The Red Arrows, one of the world’s foremost aerial aerobatic display teams will perform high above Blackpool Promenade on Saturday 12 and Sunday 13 August. The RAF Typhoon display team and the Battle of Britain Memorial Flight are also confirmed for both days of this year’s show. The programme will also feature a whole host of incredible flying machines with details to be confirmed in coming weeks. 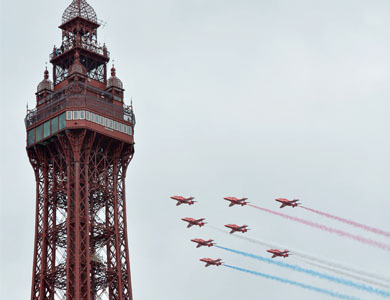 Cllr Gillian Campbell, Deputy Leader of Blackpool Council, said: “The Red Arrows are a huge favourite with visitors to the Blackpool Air Show and its truly fantastic news to hear that they will return to Blackpool for two days this year. “The Air Show is always an important date in our calendar and I’m certain that this year will be no different. 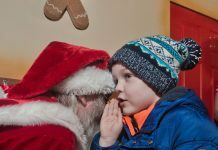 “The show brings in tens of thousands of people on to the Promenade and provides a huge boost to our local economy, with those visitors spending money in our shops and restaurants and supporting our jobs. The full line-up for the Blackpool Air Show will be revealed in due course.